Joe Arpaio addressed the media in 2013. 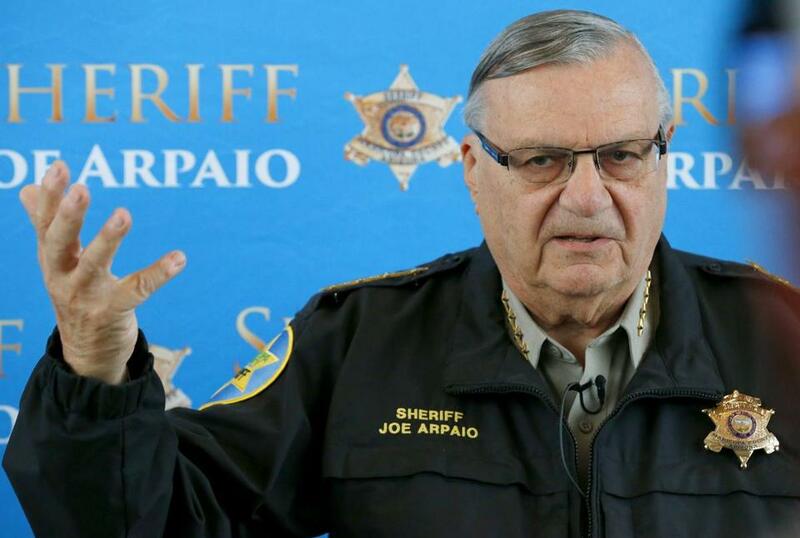 As the sheriff of Maricopa County, Ariz., Joe Arpaio was an authoritarian and incompetent disgrace to public service. He bragged of confining inmates in conditions so harsh that they amounted to a “concentration camp,” and in his zeal to find illegal immigrants he engaged in naked racial profiling — even after a federal court ordered him to stop. Having grown infamous for his abuses of power, Arpaio was finally expelled from office by Arizona voters last year, and convicted last month of criminal contempt. Yet last week, despite showing not a shred of remorse, he was unilaterally pardoned by President Trump. Nevertheless, Trump’s action was perfectly legal. The Constitution grants presidents unfettered authority to pardon anyone of any federal crime they may have committed. It is the sole presidential power that the other branches cannot check or balance. While Trump’s in-your-face pardon of Arpaio is noxious, he isn’t the first president to use his pardon power for political gain or for the benefit of an undeserving scoundrel. On his way out of the White House in 2001, Bill Clinton pardoned Marc Rich, a fugitive billionaire who fled to Switzerland after being indicted on 51 counts of fraud and tax evasion. Clinton professed to find it “particularly painful” that anyone could imagine that his pardon was connected to the lavish sums that Rich’s wife donated to Clinton’s presidential library foundation ($450,000) and Hillary Clinton’s Senate campaign ($100,000). But the public outrage was bipartisan. So were the calls to rein in the pardon power. Senator Arlen Specter, a Pennsylvania Republican, proposed a constitutional amendment that would make pardons revocable by a two-thirds vote in the House and Senate. Massachusetts Representative Barney Frank recommended banning presidential pardons in the last four months of an president’s term. Neither idea got off the ground. Nor have numerous other proposals made over the years to restrict presidential pardons. 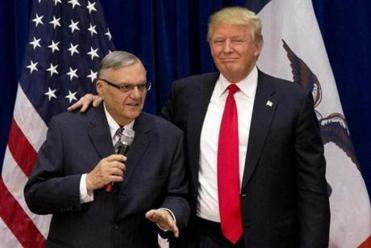 Yes, President Trump does have the legal authority to pardon Joe Arpaio. But watch out next time. By definition, pardons (and other forms of clemency) work an end run around the legal system, so it’s inevitable that they are frequently controversial. Gerald Ford’s blanket pardon of Richard Nixon was so unpopular it helped cost him the 1976 election. George H.W. Bush infuriated many when he pardoned the officials involved in the Iran-Contra investigation. So did Barack Obama when he granted clemency to Chelsea Manning, the Army intelligence analyst-turned-traitor. The Constitution’s framers weren’t naïve. They understood the obvious dangers in giving presidents the power to prevent or short-circuit prosecutions. But they decided it would be more dangerous not to include such an escape hatch in the Constitution. In Federalist No. 74, Alexander Hamilton argued that without “exceptions in favor of unfortunate guilt, justice would wear a countenance too sanguinary and cruel” — i.e., that when hard cases make bad law, society needs a way to temper strict justice with mercy. Hamilton also foresaw that there might be “critical moments when a well-timed offer of pardon to . . . insurgents or rebels may restore the tranquility of the commonwealth.” Indeed, the very first presidential pardon was granted to the leaders of the Whiskey Rebellion, an armed taxpayer uprising in 1794 that could have shattered the new republic had President Washington not defused it peacefully. Perhaps presidential clemency is most valuable when it stops the criminalization of political differences. Under Woodrow Wilson’s authoritarian rule, the Socialist Party leader Eugene Debs was imprisoned for criticizing US involvement in World War I. It was an appalling violation of the First Amendment — one that Wilson’s successor, Warren G. Harding, finally ended in 1921 by pardoning Debs (and inviting him to the White House for a visit). In a democracy, unscrupulous leaders like Trump or Clinton will always be a risk. Most presidents, fortunately, have cared too much about the nation’s welfare — and history’s verdict — to misuse presidential clemency. Yes, the pardon of Joe Arpaio is disgraceful. But the power to grant it belongs in the Constitution.